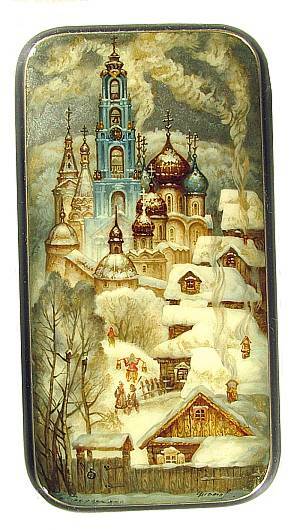 The tiny inhabitants of a snow covered village race to finish their chores beneath the watchful tower of the church. Diaphanous billows of smoke waft heavenwards before being parted by the golden spire of the bell tower. Brilliant golden accents twinkle throughout the scene, adding a feeling of warmth to the town while contrasting beautifully with the cold pewter hues of the frozen sky and countryside. 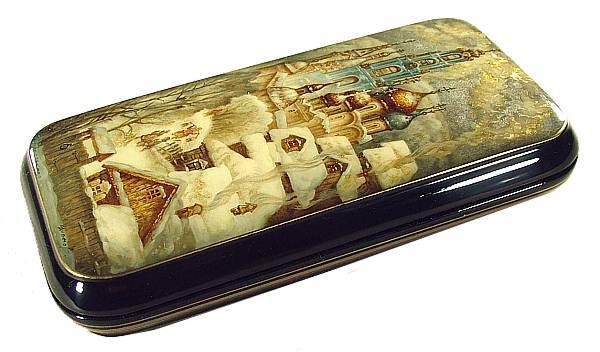 Considered to be one of the best living lacquer artists, Chistov's work has been featured in numerous exhibitions and books on the art form. His works often feature religious elements, delicate color, and brilliant gold. This box is made of high quality papier mache and is signed on the lid with the artist's name, village, and date of completion. There is a hinge on the left, and the interior is red lacquer. The body and flush base of the box are decorated with thin layers of shimmering gold and silver paint.